together! One of the best means to ensure a giant flop is to run out of power. Modern presentation devices used in college classrooms almost invariably depend on battery power. Suffice it to say that if you have not experienced dead batteries in the remote control of the projector, in the main battery of the laptop or the built in, rechargeable, IPod batteries, you probably haven't had to do the apology tap dance before starting a class. While the old “It worked in my office” opener is cute, it’s been done before. We all know that double checking these things prior to presentation works best, but the insurance of spare batteries is always in order. .Disposable batteries are convenient and initially inexpensive, but they are hardly environmentally friendly. Rechargeable batteries, while more eco conscious and cheaper overall, have the significant drawback of being "dead" and needing charging right out of the package. Sanyo's Eneloop batteries have overcome that. By radically changing the chemistry of their rechargeables, they are able to ship them ready-to-go, like disposables and still remain reusable. The author, always skeptical of advertising claims until they are tested, put Eneloop batteries in two sizes into service almost a year ago. They not only lived up to the claim of having about 80% of their charge retained for very long storage periods and having very long use time, but they recharged quickly as well. Scratch one for skepticism. electronic devices that have internal batteries. My only real quibble with Energizer is that while they initially pack up to 3 adapters for a given family of phones ( e.g. the Motorola package on the left), they don’t sell new connectors individually,. That forces the purchase of new charger to get a connector for a different brand of phone or type of device. Energizer recommends that you use their own lithium disposable batteries with Energi To Go because of their high current output, which allows the almost immediate use and recharging of the attached devices, but it can be used with other types of batteries. A little experimentation showed that lithium batteries charged my dead PDA in about 3 hours, while alkaline cells did it in about 3.5 hours and the Sanyo Enerloop batteries in about 4 hours. 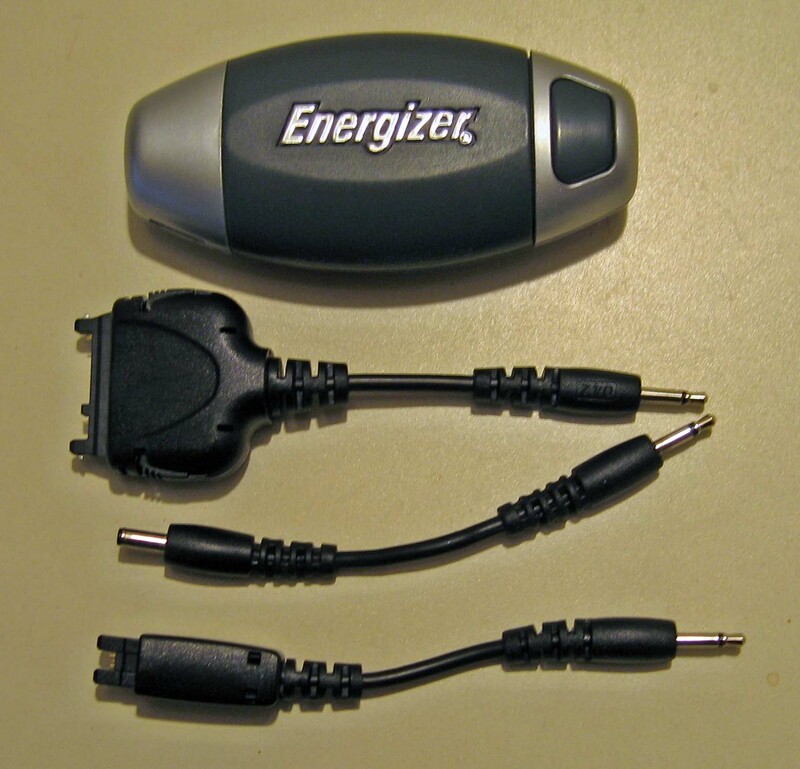 Cell phones usually charge even faster, All kinds of batteries in the Energi To Go allowed the PDA or cell phone to be used in less than 2 minutes. While the original lithium battery configuration worked best, it seems that the rechargeables have more than acceptable performance for an eco-friendly, "greener" product. Unless you get a “charge” out of doing the time-step waiting to begin a lecture, give this combination a try! P.S. 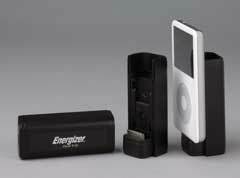 Here’s the new Energi To Go, dedicated to the iPod only, with a smaller form factor and no cables!